Mister Rogers arrives with a bandage on his left hand after having bumped it on a piece of metal. He pulls back the bandage to reveal the minor injury and to show that his hand is still there even though it is covered by the bandage. Curious to learn how adhesive bandages are made, Mister Rogers calls Mr. McFeely to request a film on that topic. After the call, Mister Rogers sings Let's Think of Something To Do as he draws on a piece of paper with a marker. In the Neighborhood of Make-Believe, Lady Aberlin is painting at the castle as the Trolley arrives. After she paints a quick portrait of the Trolley, King Friday brings out his bass violin and plays as Lady Aberlin continues painting. King Friday and Lady Aberlin agree that a person can be many things; for example, King Friday is "a king, a father, a husband, an uncle, and a fine bass violin player." Miss Paulificate arrives with a phone call for Lady Aberlin from Dr. Bill who asks for some help in putting a bandage on Ana. At the Platypus mound, Ana has fallen and scraped her paw but does not want a bandage placed over the injury. Lady Aberlin is able to convince her otherwise after she gives Ana one of her paintings and Dr. Bill plays some music on his bagpipes. While she places the bandage on Ana's paw, Lady Aberlin reminds her and Dr. Bill of the many wonderful roles that they both fulfill. Back at the house, Mr. McFeely invites Mister Rogers to stop by Negri's Music Shop for something special. At the Music Shop, Mister Rogers finds Joe Negri and Carl McVicker waiting inside. Together they enter the rehearsal room where several relatives of Wynton Marsalis perform a few jazzy numbers including a variation of Won't You Be My Neighbor. 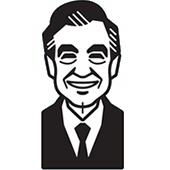 Returning to the house, Mister Rogers talks about how music can raise a variety of feelings. He also reflects on the various instruments played by the Marsalis family at the Music Shop. After Lady Aberlin's call from Dr. Bill, King Friday recieves a call from the "new president of old." The photograph below is a promotional print from this Episode featuring Mister Rogers and the Marsalis family.